They were actually both winners. 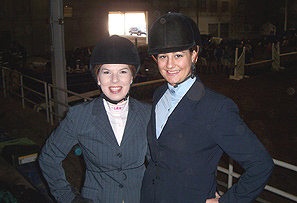 Meghan Shader of the University of Kentucky (on right) won her open flat class while teammate Jenny Naylor (on left) was a winner in open fences earlier in the day. 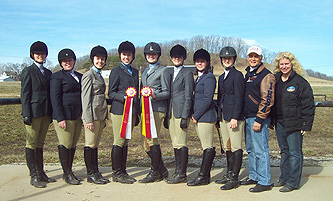 Wildcats Head Coach Michelle Zimmer (center) poses with both riders after they placed 1-2 in open flat on February 13th in Morehead, Kentucky. Morehead, KY - If you have never been to the Derrickson Agricultural Complex in Morehead, Kentucky then you have not seen one of the better indoor riding facilities in the IHSA. The arena has grandstands on both sides for several thousand spectators. 1992 IHSA Nationals were held in this room, a more fan-friendly facility than several which have hosted Nationals since. On February 12th and 13th Morehead State University hosted Hunter Seat and Western shows both days inside the Derrickson Complex indoor. This story pertains to the hunter seat show held on Sunday the 13th, which started with Morehead State senior Brianne Osborne making the first open fences ride at 9:03AM and concluded with the placings of the fourth novice flat class at 2:30PM. A total of 19 classes (15 flat and four over fences) took place in roughly five and a half hours. And for a second straight day the region-leading University of Kentucky Wildcats had prevailed as high point team. In fact through the first six hunter seat shows of the 2010-11 season Kentucky has yet to lose or score below 33 of a possible 49 points. Northern Kentucky University teammates Laura Weber (on left) and Lauren Fehrenbach pose in the stands of the Derrickson Agricultural Complex arena during what was a forty minute schooling break. In the second class after the break ended, Fehrenbach finished second in advanced walk-trot-canter. Northern Kentucky was fourth for the day with 19 points. Jenny Naylor, a University of Kentucky junior from Baltimore, Maryland won the section of open fences which started the day while later placing second in open flat to lead the way for the Wildcats. Doug Masters (sophomore, from Columbus, Ohio) was a winner in open flat to finish the weekend with two firsts and a second over two days. Meghan Shader, who is also a junior from Baltimore, Maryland, won the second section of open flat to relegate Naylor to the red ribbon. Eleanor Feltner (freshman, from the Detroit, Michigan area) and Stephanie Rowney (junior, from the easy-to-remember town of Newmarket Dury St. Edmonds, United Kingdom) won intermediate flat classes for the Wildcats. Allie Board (freshman, from Louisville, Kentucky) won her first IHSA hunter seat blue ribbon, topping the field of nine in the second section of novice flat. Brianna Goodnow (freshman, Mundelein, Illinois) won the third novice flat class to bring the Kentucky blue ribbon total to seven for the day. Freshman Sarah Whitten was a red ribbon winner in both novice flat and fences. Gigi Goble (in novice flat), Holly Ray (same), Jessica Brown (in beginner walk-trot-canter) and Hannah Eldridge (in walk-trot) were also second-place winners for Kentucky. The Wildcats scored 35 points, two more than their total of 33 on Saturday. Not since opening day had the University of Cincinnati earned reserve high point team honors, but on February 13th the Bearcats not only accomplished this they came closer than anyone so far this season to the Wildcats. Cincinnati scored 30 points to fall by only five points (previously Morehead State had come the closest to Kentucky, with the Wildcats prevailing 35-29 at the second show of the season). Taylor Douglas, a freshman coincidentally from Cincinnati, Ohio won her novice fences while finishing second to Board in novice flat to create a ride-off with Naylor. Leslie Gilb, a junior from Fort Thomas, Kentucky won the lone section of intermediate fences. Gilb qualified for Regionals in the division in the process. Caitlin Gross added a red ribbon in advanced walk-trot-canter. Despite not having a rider in either open division and only nine riders entered overall (while Kentucky had over 30 riders entered, including four in both open divisions) it was the Bearcat's best show of the season and a vast improvement on their 19 score a day earlier. Riders named Lauren earned the top two placings in the first section of advanced walk-trot-canter. Lauren Moore of Midway College (on left, with Coach Carrie Dahmer) beat out Lauren Fehrenbach to win her first-ever IHSA blue ribbon. Moore was the first of three Midway freshmen to win a class on February 13th. Midway College was the most consistant team over the February 12/13 weekend. The Eagles (same nickname as host Morehead State) scored 25 points at both shows, coming in third on the 13th. Lauren Moore, a freshman from Onalaksa, Wisconsin was the first Midway rider on day two to earn a blue ribbon. Moore's first in advanced walk-trot-canter was also her first-ever IHSA blue ribbon. Four classes later lightning struck twice. Courtney Komjathy, a freshman from Clinton Township, Michigan won her second of advanced walk-trot-canter to earn her first-ever IHSA blue ribbon. Chelsea Elliott, a freshman from Louisville, Kentucky went two-for-two over the weekend. Elliott won the second section of intermediate flat to raise the Midway blue ribbon total to three for the day. Samantha Bussell was second in her beginner walk-trot-canter while open rider Allison Born was second in both of her riders. Born moved into a tie with her sister Erinn for second place in the Region 3 hunter seat open rider standings, with both entering the final two shows to be hosted by the Wildcats. The Born sisters each held 41 points through six shows, which put them 13 behind Ali Cibon of Kentucky who surprisingly gave back ground to both with only 12 points earned in total over the weekend. With a third in advanced walk-trot-canter, Jacquelyn Theaker of Midway qualified for Regionals in the division. Northern Kentucky University had their second-best of the season, finishing fourth with 19 points. The Norse were led by Ali Smith, a sophomore from Burlington, Kentucky who won the first section of beginner walk-trot-canter. Sophomore Lauren Fehrenbach was second in advanced walk-trot-canter. Northern Kentucky nearly had a full card, lacking only an intermediate fences rider. Xavier University of Ohio was fifth for the day with 15 points. Ellen Davis, a sophomore from Chicago, Illinois was a winner in intermediate flat for the Musketeers while Alex Calvert (sophomore, from Piqua, Ohio) won the final novice flat class before the ride-off. Like Midway's Elliott, Calvert went undefeated over the February 12/13 weekend. Freshman Della Wilz was second in novice fences for Xavier, which showed without riders in either open division or in walk-trot. 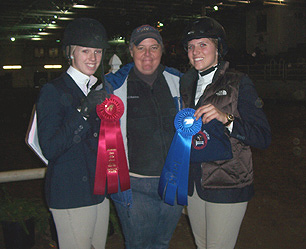 Through the first 13 classes on February 13th Della Wilz (on right) had Xavier University's top ribbon with a second in novice fences. 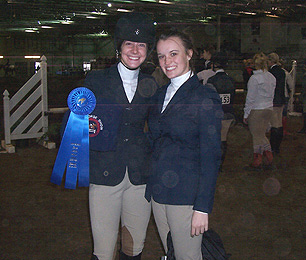 However in the 14th class Musketeer teammate Ellen Davis (on left) won her intermediate flat to earn the first of two blue ribbons for Xavier on this day. Compared to previous shows, today's event was a low-scoring affair. Several schools had their low scores of the season to date, including Louisville. The Cardinal scored 11 points, with Katie Torp earning the best ribbon of the day early on. A junior from Santa Cruz, California, Torp's win in novice fences also produced her first-ever IHSA hunter seat blue ribbon. Hanna Salmon (in intermediate flat), Julia Nabor (in advanced walk-trot-canter) and Michelle Wiseman (in intermediate flat) produced red ribbons in consecutive classes for Louisville, whose previous low total had been 19 points. Host Morehead State University was one of two schools to score eight points. The Eagles (same nickname as Midway College) claimed several fine individual performances. Sarah Lynch, a junior from Pittsburgh, Pennsylvania won her advanced walk-trot-canter to qualify for Regionals in the division. Candice Carson, a freshman from Versalles, Kentucky was yet another rider with a first-ever IHSA hunter seat blue ribbon. Carson was a winner in beginner walk-trot-canter. Jessica Lasseter was second to Gilb in intermediate fences for Morehead State's only red ribbon. Marshall University had the smallest roster at today's show, with only three members of the Thundering Herd present. Marshall had three divisions covered, with two riders in each novice division plus a walk-trotter. Aja Smith, a freshman from Riply, West Virginia (with a double major in Biology and Chemistry) earned seven of Marshall's eight points with a first in walk-trot. In total contrast to the many freshman who either won for the first time or won a hunter seat class (as oppossed to a western class) for the first time, Smith was a blue ribbon winner for the second time on this day. Always in the ribbons, Smith claimed to have qualified for Regionals with the win (though her name did not appear on later Regional Qualiifer lists forwarded to Campus Equestrian. Can anyone confirm Smith rode in walk-trot at Regionals?). IHSA Founder and Executive Director Bob Cacchione (second on right) made the journey out to Morehead, Kentucky where he saw the University of Cincinnati give the Kentucky Wildcats a run for their money before coming up five points short. Coached by Missy Jo Hollingsworth (on far right), the Bearcats took over second place after the third show of the year and held that position for the remainder of the 2010-11 season. The Ride-Off: The Ride-Off was won by Naylor, who had also won a ride-off her freshman year. It was apparently the first ride-off for Douglas. The Wildcats finish the regular season undefeated: The final two Zone 6, Region 3 hunter seat shows of 2010-11 were hosted by the University of Kentucky and were also won by the Wildcats. Between 2010 IHSA Nationals and 2011 Zone 6 Zones the Wildcats went undefeated, finishing 107 points ahead of second place Cincinnati. The winning streak finally came to halt at Zones, when Miami of Ohio took high point team honors. Still the Wildcats were second and thus advanced a full hunter seat team to IHSA Nationals for the fifth consecutive season. 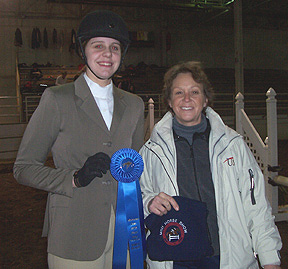 Cibon, a senior from Bannockburn, Illinois earned three firsts and a second over the final two shows to finish ahead of Allison Born by a 80-57 margin (Erinn Born was third with 48) to represent Region 3 at 2011 IHSA Nationals in the Cacchione Cup Competition. Show Incidentals: Sunny skies but windy, with temperatures in the mid '40's. Entire show held indoors. Start Time: 9:03AM. Finish: 2:30PM - includes 40 minute schooling break. Coaches & Captains meeting held prior to start of show. Point Cards posted in this region? No, though a scoreboard was updated during the competition. Alumni Classes held in this region? Not for hunter seat during the 2010-11 season. Judge: Kelley Corrigan, Lexington, Kentucky. Stewards: Zimmer/University of Kentucky, Dahmer/Midway College and Foster/Northern Kentucky University. Team Totals: University of Kentucky (High Point Team) 35; University of Cincinnati (Reserve) 30; Midway College 25; Northern Kentucky University 19; Xavier University of Ohio 15; University of Louisville 11; Morehead State University 8 and Marshall University 8.